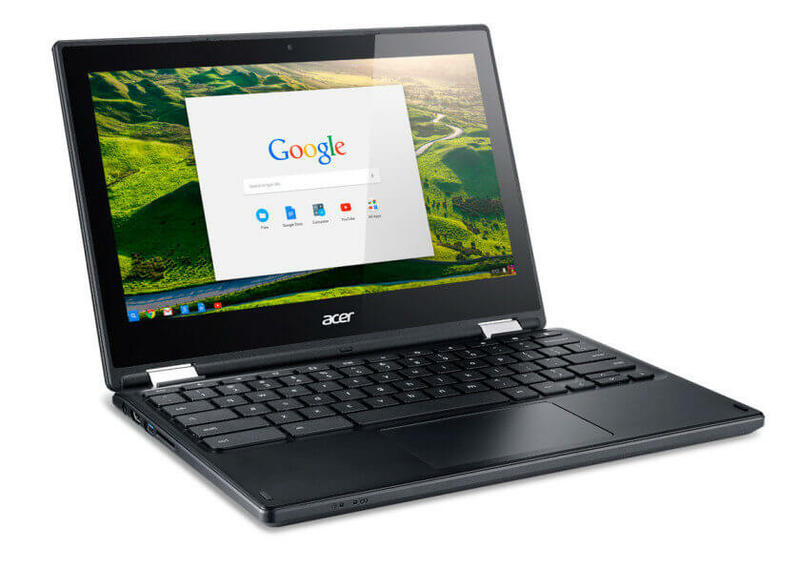 In addition to the six new smartphones that Acer announced today at IFA 2015 in Berlin, the company also announced a brand new 11″ Chromebook, the R11. The Chromebook R11 is the first fully convertible Chromebook from Acer and sports an 11″ 1366 x 768 LCD display and is powered by an Intel Celeron processor. The R11 will be able to have up to 4GB of RAM and 32GB of on-board storage depending on the configuration you purchase. As for price, the Chromebook R11 will start at $299. BERLIN, GERMANY (September 2, 2015) Today Acer, the market leader and pioneer in the Chromebook category, adds the company’s first convertible Chromebook to its line-up, the Acer Chromebook R 11. The new Chromebook is packed with the latest technology and features for a faster, more productive and flexible user experience. Following the success of Chromebook line since Acer entered the space in 2011, the Chromebook R 11 is Acer’s first convertible notebook. It easily transitions between four usage modes: laptop, pad, display and tent modes, letting customers enjoy the Chromebook in a variety of settings. 1 Based on an IEEE 802.11ac draft specification. Actual speed will vary based on range, connection rate, site conditions, size of network, and other factors. ￼￼ According to Gartner, Acer is the world’s leading Chromebook brand with over 36 percent market share in 20142. The Chromebook R 11 is equipped with Acer’s patented 360 degrees dual-torque hinge design, enabling customers to manipulate the display to any degree that is most comfortable for the setting. The dual-torque hinges keep the display secure and stable during touch control and while switching between the modes. Always smart, the audio channel output automatically reverses as the display changes orientation. Since the classic laptop experience is still a crucial part of the way people use their Chromebooks, users will find themselves right at home in laptop mode when they need to access the keyboard for an efficient and productive input experience. Pushing back the Chromebook into display mode hides the keyboard and brings the display closer to make the most of visuals and entertainment. As the Chromebook R 11 is flipped, the on-screen image automatically rotates 180 degrees to the correct viewing orientation. Tent mode provides an ideal viewing and touch experience in confined spaces such as when traveling on a plane or train. Push the display back 360 degrees so the Chromebook converts to pad mode for a quick and efficient way to play, share and browse. The Chromebook R 11 supports both landscape and portrait pad modes. The 11.6-inch HD (1366 x 768) screen with wide viewing angle is complemented by an HD webcam with HDR (High Dynamic Range) imaging, with a crisp and vibrant touch screen display. The LED-backlit LCD screen has integrated 10-point touch, supporting Tap, Swipe and Pinch to Zoom gestures so any web page or app can benefit. The Acer Chromebook R 11 is the ideal device for a range of customers who view, edit, create and collaborate in programs such as Microsoft Office Online documents and Google Docs. Chromebooks are simple to use and ideal for sharing by multiple users, since users can log into their own account to access Docs, website bookmarks and other information. Storage on Google Drive protects files, documents, and photos safely in the cloud, and ensures that the most current version of the file or document is always available and safe, even if the Chromebook is lost or stolen. Security is a key benefit of the Chrome OS, as it’s automatically updated to guard against ever- changing online threats. In addition, the Supervised Users feature helps get customers online in a safe, controlled way. The Acer Chromebook R 11 will be available in North America in October with prices starting from $299. It will also be available in EMEA starting in November at prices starting at €299. To find out about availability, product specifications and prices in specific markets, please contact your nearest Acer office or retailer via www.acer.com.